b)The game may never be returned to a previous state. What is the maximum number of moves that James can make? For the sake of simplicy I'll solve the problem for $N=10$, leaving it up to you to extrapolate it for any given $N$. Denote the number of pebbles in the red jar with $x$ and the number of pebbles in the blue jar with $y$. 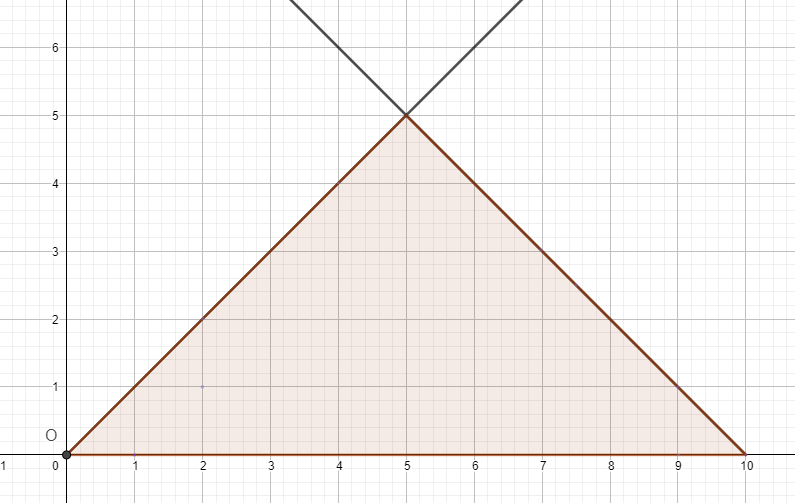 Represent allowed values for $x$ and $y$ in a plane and you get a shaded triangle. 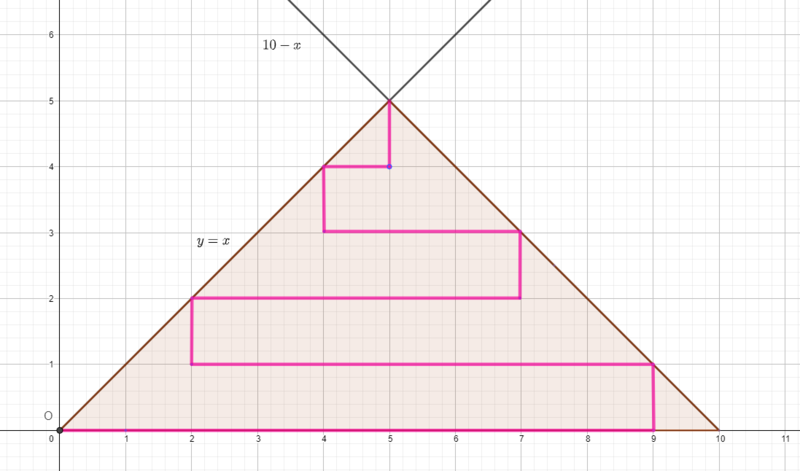 This shaded area represent the limits imposed in your problem: $x+y\le10$ and $x\ge y$. Each point with integer coordinates (including those on triangle edges) represent a valid state of your problem. If you connect all game states you get a path. That path cannot use each valid point more than once (states cannot repeat). The length of the path represent the number of state transitions. A path of maximum lenght is obviously a solution to your problem. Blue points have even value of $x+y$. Points with odd value of $x+y$ have red color. Notice that colors always change between consecutive points. The number of red points can be determined in the same way: $5+4+3+2+1=15$. So if you use all red points, the maximum number of points in the path is $2\times15+1=31$, which means 30 state transitions. Now we know the upper limit but is it reachable? Is it possible to construct such a path? Yes, in a fairly simple and straightforward way which is applicable to any number of pebbles. 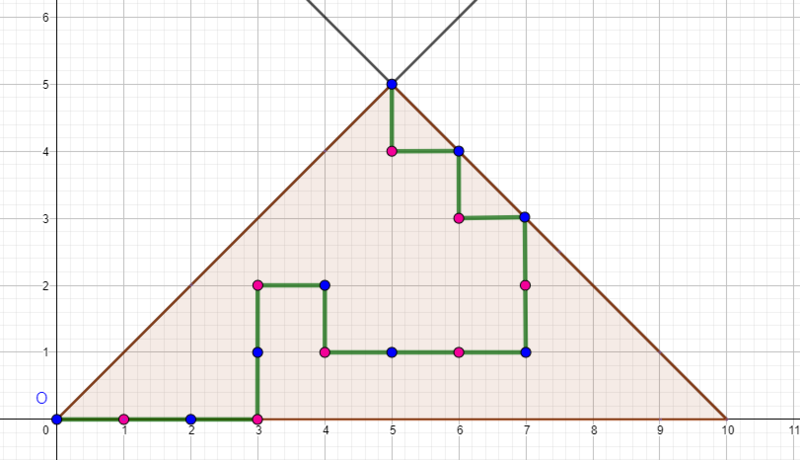 The following path has 31 points and 30 state transitions. Not the answer you're looking for? Browse other questions tagged combinatorics contest-math combinatorial-proofs or ask your own question. Math contest question - prove unsolvability of equations. Simpler solution for EGMO 2018 Problem 3? Three piles, can only move stones if doubles a pile. Prove we can always empty a pile. How would you go about proving this?